Android, iPhone or Windows, Whatever your preference in mobile devices, at DMG Communications, we’ve got you covered. Clearly, they are called ‘smartphones’ for a reason. That’s because, when you find the right mobile phone, your business is with you wherever you go. Stay in contact when you are away from the office, receive emails in the remotest locations and take important orders even when relaxing at the beach. Ever wondered why some mobiles don’t work as well as others in certain places? Coverage and signal strength are important factors. The Telstra Mobile Network is Australia’s largest 3G and 4G enabled mobile network covering 99.3 per cent of the Australian population across more than 2.3 million square kilometres. That means you’ll enjoy coverage across more than double the area of any other mobile network in Australia. We are working hard to make sure our customers remain at the forefront of mobile connectivity. Telstra continues to lead the way in providing Australians access to all the latest 3G HSPA (High Speed Packet Access) and 4G LTE (Long Term Evolution) speed technologies. Telstra not only offers the largest 4G coverage – it is backed by the largest 3G coverage so you can connect faster in more places. Not all mobile networks are created equal. With Telstra, you will be able to enjoy a more reliable national mobile network. Our award recognised mobile network has more coverage sites connected to a fibre based, Ethernet-enabled backhaul than any other mobile network. This means you are able to enjoy more coverage with greater speeds and reliability in more places across Australia. We’re also very proud that for the second year running Australians rated Telstra as ‘Highest in Wireless Network Quality Performance’ in a J.D. Power and Associates study. Autumn 2013*. We want you to have the best mobile experience possible. HD Voice not only delivers crystal clear voice quality it also provides noise suppression features making your HD-compatible handset much more effective in noisy environments such as on the train, in crowded places or in heavy traffic. Customers calling between HD-compatible phones on the Telstra Mobile Network can access the higher quality calls at no extra cost. 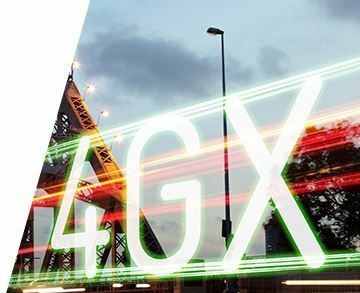 Telstra 4GX brings you the fastest 4G speeds in Australia, up to three times as fast as our regular 4G on a compatible mobile device in a 4GX area. Only on Australia’s best mobile network. When analogue television was switched off in Australia, the spectrum it was running on – 700MHz – became available. We took up twice as much of this superior spectrum as any other carrier to deliver you 4GX.